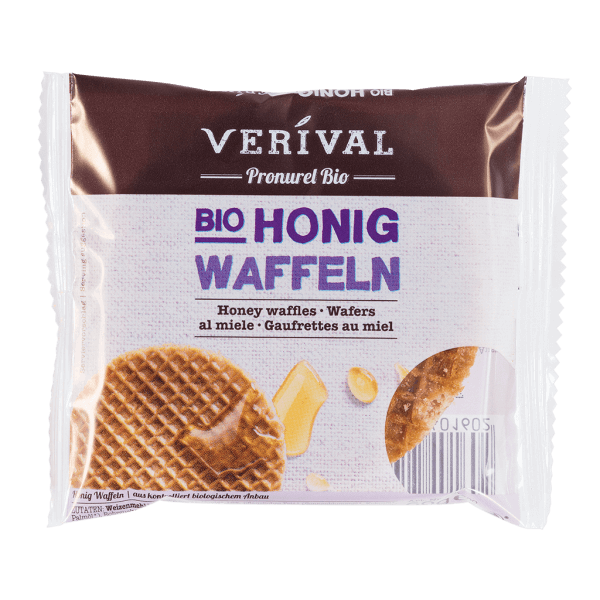 With their high honey content (16%), Verival Bio honey waffles are an energy source and a delicate snack all rolled into one. The twin pack is ideal for carrying around, whether in a handbag, school bag or briefcase. The ideal pack size for a snack between meals. A handy snack pack. Wheat four*, wheat syrup*, honey* 16%, vegetable fat* (sunflower-*, coconut-*, palmoil*), cane sugar*, eggs*, emulsifier: sunflower lecithin*, salt, baking agent: sodium bicarbonate; cinnamon*. > May contain traces of milk, sesame seeds, soy and shell fruits.